100 Ton Cap, 150' of Main Boom, 31'-55' Bifold Jib, 24,000 Lbs of removable counterweight, two winches, 80 Ton 5 sheave Block, headache ball, LMI and Anti Two Block system, certified, A/C. 80 Ton Cap, 126 Ft Main Boom, 33-57 Ft Jib, LMI, A2B, meter was replaced at 8,720 hours, certified, Cummins Engine. two winches, A/C. 80 Ton Cap, 126' of Main Boom, 33'-57' offsetable Jib, Cummins Tier 3 Engine, Greer Element LMI and Anti Two Block system, Certified, Two winches, A/C. 70 Ton Cap, 111' of Main Boom, 33'-57' Offsetable Jib, Greer Element LMI and Anti Two block system, Two winches, certified, A/C, Cummins Engine, block and ball. 50 Ton Cap, 110' of Main Boom, 32'-56' offsettable Jib, Cummins Engine, PAT LMI and A2B system, two winches, block and ball, 70,470 miles. 50 Ton Cap, 110' of Main Boom, 32'-56' offsettable Jib, Cummins Engine, PAT LMI and A2B system, two winches, block and ball, 70,470 miles. Crane is located in Montreal but price includes delivery to Newark Port. 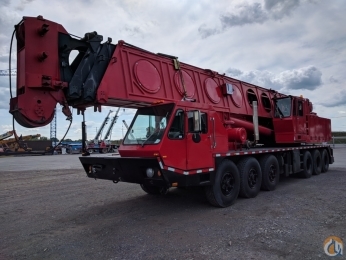 , Cummins, 253' boom plus 80' jib, 2 winches, AC cabs, self erect, 100 ton block & ball.